2012… It was all about colour, the brighter the better! This winter the tried and true colour combination of black and white is back. 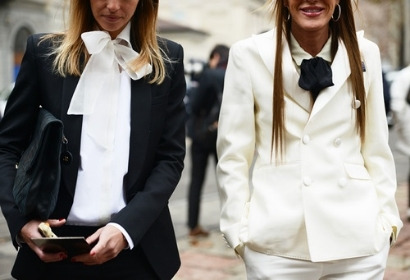 How to wear black and white without feeling like you’re in the hospitality industry? Mix textured fabrics. Think silk or wool, leather or fur. Play with proportions, this season try an oversize coat with skinny coated jeans. Use accessories to give your outfit personality, a leather cap or woollen beanie? Look for unique garment cuts to create interest. Try wearing black on the top and white on the bottom. What if black or white doesn’t suit your colourings? Wear winter white or ivory instead of bright white near your face. Consider the neckline of black garments; choose one with low density around the face, for example, shoe string straps. If you’re really struggling, pair black and white with dark denim, khaki or grey marle.